Noel: I’m sighing because even while on vacation, we start the episode with Wendy baking something. Is she not allowed to go swimming? She’s also the best intern ever, volunteering to head out on an investigation during their summer vacation. Andy: Don’t forget about the cyclone over the Atlantic which Wonder Woman defeats in an action sequences that’s not so much “thrilling” as it is “easily animated.” This is one of those times when it’s hard to suss out how much of the Super Friends aesthetic is due to production values or to a conscious echo of comic book style. Where an 8-page Wonder Woman story might give us a big block of narration box text over every panel, here we get Ted Knight explaining exactly what she’s doing down to the exact speed she’s doing it at. Meanwhile, the Dynamic Duo and the Tepid Trio arrive at the “United States Government Building.” Because Super Friends takes place in an alternate universe where Grover Norquist and his cronies have succeeded in shrinking the state to where its entire operation can be carried out in one gray, boxy mid-rise. A few nondescript bad guys turn up, and the ensuing chase sequences are embarrassingly ineffectual. Last week we discussed the challenges in making Wonder Woman and Aquaman exciting, but now I think Batman and Robin are harmed even more by this format. The kids-TV restriction on even a scrap of violence severely limits their usefulness in an action scene. Noel: Though it is nice to see Wonder Dog earning his keep by figuring out a semantic loophole that allows him to later follow Thinkwik (because he’s a dog, not a person, you see). And the sequence is generally kind of cute. We get the whole “completely hide behind the pole” gag (which I can do in real life, by the way), and then more charades as Wonder Dog tries to explain that Thinkwik used a device to start the windstorm. I like to think that the charades are part of Batman’s reasoning training for the interns. Aquaman’s first big appearance of the episode demonstrates the limits of his powers a bit. The telepathy sequence with Globi the pilot whale isn’t the most compelling storytelling since it too relies heavily on the narrator to make sense of the action. Indeed, the narrator sticks with us even as he saves the dolphins from the vicious seaweed that feels like a stand-in for old nets and trash that dolphins get caught in. Andy: How much cooler would it have been if they’d gotten, say, Lorenzo Music to voice the whale? Anyway, after the whole gang gets together and decides to seek out a pattern in the weather anomalies, we’re treated to what is without a doubt the most pulse-pounding scenes of data collection and reporting in the history of cartoons. Noel: I’m not exactly sure where Wicker and Malvit intend to get nuclear fuel, but I suppose I’d best just roll with it. Now we get an explanation of how the jet stream affects the weather, with a quick sum-up of its influence on temperatures. I do feel like this episode does a better job of making everyone feel involved in the primary action, even while they still all get their individual tasks to do. I’d even go so far as to say that even Wendy and Marvin’s investigations on board the weather controlling boat are certainly better than what we saw in “The Power Pirate.” There’s a little more skill on their part, and even if it’s a little silly still, it all fits. Like with the alien in “The Power Pirate,” we also get an indication that Thinkwik’s not all bad, given his willingness to return Wendy and Marvin to safety. And I’d really like to know why Malvit hasn’t put on a new pair of pants yet. I mean, really. That’s just awkward. Andy: This is a precisely-calibrated evil scheme, Noel. They didn’t build in buffer time to hit J.C. Penney on a pants run. Speaking of evil schemes, we finally find out what Thinkwik and crew are up to, and is it ever a slice of lunatic Silver Age villainy. Turns out they come from a tiny country in the Arctic circle which, despite being all but uninhabitable, has supplied them with the resources to build a giant honking undersea nozzle that can reverse the Gulf Stream. And rather than, say, emigrate to balmier climes, they’ve decided to go the phenomenally more convoluted route of re-engineering the entire climate of the Atlantic seaboard to make their homeland a tiny bit livable. The Lex Luthor of this era would respect the hell out of that plan. Noel: I do love it that most villainous plans always come down to real estate. Really, it’s the most important thing. It is a bit of an odd reversal, his plan. I’m actually rather surprised that the episode went in this direction. It’s about melting the polar icecaps, essentially, which would cause massive amounts of sea level rising. But then again, Thinkwik makes a decent point about how climate policy does affect those we don’t think about. It’s oddly prescient, again, this time of the Alliance of Small Island States and how they seek to raise the alarm on climate shifts. So Batman and Robin head back to the United States Government Building to catch up with Wicker and Malvit (who has gotten pants, finally). 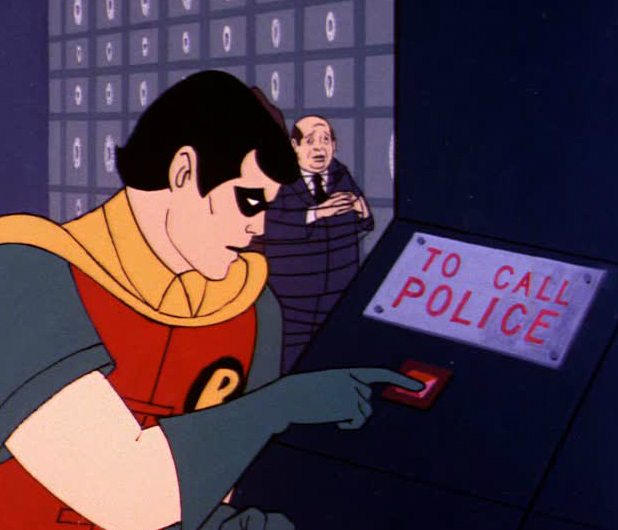 It’s amusingly sweet that Robin wants to call the FBI to get the keys to the place. And then they take the stairs. BECAUSE IT’S ONLY FIFTY FLOORS, ANDY. 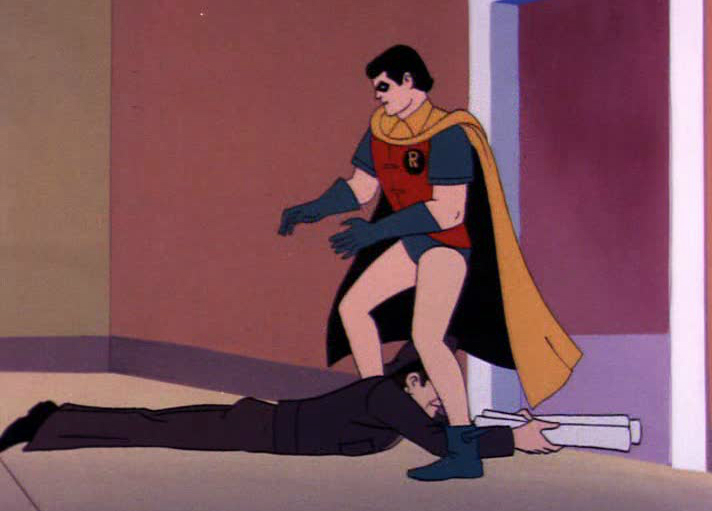 Deep down, I really love the Silver Age antics of Batman and Robin. Andy: Just to reiterate that for you: Batman and Robin, who at this point in pop culture history might be best recognized as those two guys who walk up walls, first decide to wait for an elevator and then to take the stairs. Superheroes, everybody! On the 50th floor they intercept the bad guys attempting to steal nuclear fuel, which is helpfully kept in a small oatmeal canister labeled “NUCLEAR FUEL.” This is the second episode we’ve watched that involved half-competent villains straight walking up to and snagging some nuclear power, if you’re scoring at home. No wonder Jackson Browne was so dead-set against this stuff. Noel: So everyone goes on the hunt for Wendy and Marvin (intern labor is not easy to get, folks), including a variety of whales (“The wrongly named killer whale!”) and dolphins. Certainly this is the best episode to use Aquaman’s powers that I can remember. On the boat, Wendy tries to instill some understanding of how the climate changes that Thinkwik is causing affect everyone, not just Florida (which shows that I was giving the series writers too little credit earlier). And then she gets a little hippie-dippy. Noel: Thinkwik, refusing to see reason, turns the nozzle to Irreversible, leaving the Super Friends to attempt a variety of tasks to shut it down. It all boils down to some good old fashioned teamwork to push the nozzle into the sea floor…right on top of a geothermal pocket! Yay for alternative energies! The geothermal pocket immediately turns Glacia into a balmy, lush, and sustainable tropical paradise. At the North Pole. Andy: Even more than “The Power Pirate,” “The Weather Maker” clearly demonstrates what kind of show the makers of Super Friends have in mind at this stage. They’re not interested in telling superhero stories. They’re using superheroes to tell educational stories to grade-school-aged children. It’s the audience surrogates, Wendy and Marvin, who do most of the problem-solving and villain-confronting; Superman and Batman spend as much time lecturing us about science and community service as they do pulling fishing boats out of crevasses. If all the show wanted to do was pit DC Comics heroes against a guy who can make hurricanes and snowstorms, they have Weather Wizard waiting on the bench. Instead, we get a bad guy who 1) uses science instead of magic powers, so that his machinations can provide a teachable moment, and 2) turns out to be not really so bad. 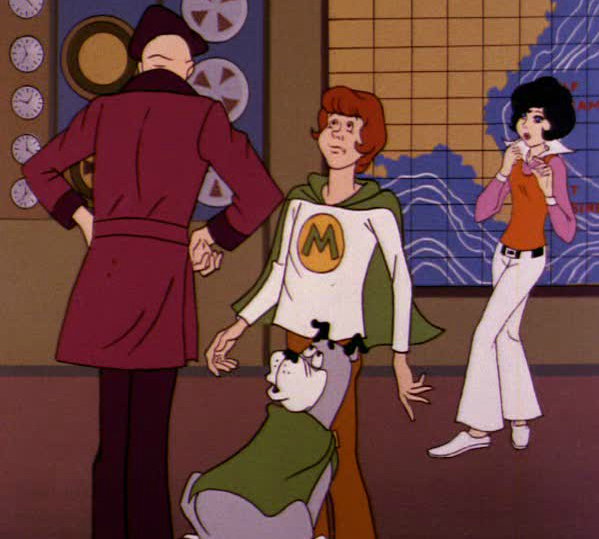 Wonder Dog turns out to be a hellhound who eviscerates Marvin and cripples Wendy. It’s the “grim-and-gritty” school of comic books showing exactly what it thinks of the light-hearted, family-friendly ethos of Super Friends, and much of the Silver Age. That picture is easily worth 1,000 words about a particular strain of fanboy psychology. Anyway, I’ll be curious to see how much of this series’ warm-and-fuzzy M.O. 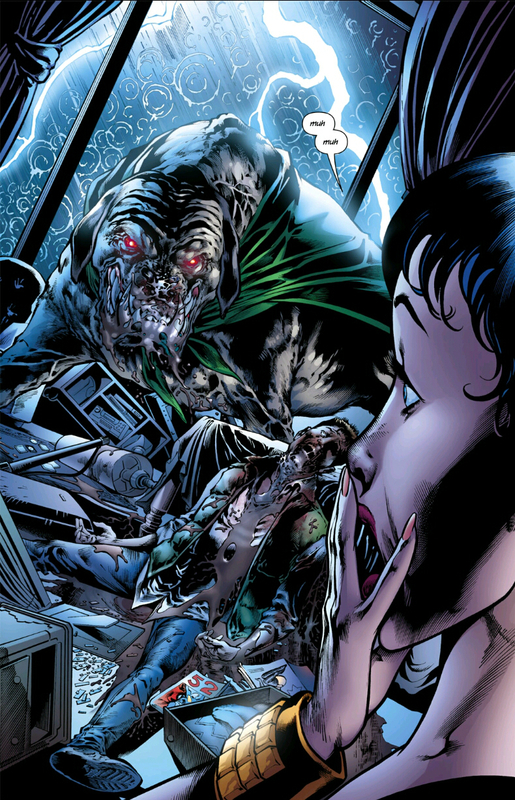 remains or evolves in its quasi-rebooted version, which is structured around what we’d consider a more traditional Justice League line-up (with a couple notable exceptions). We’ll find out in our next installment, as we leap forward in time four years to discuss the first episode of 1977’s The All New Super Friends Hour. Join us in two weeks!